The Scrumpy House at Weston's Cider01531 660626work RestaurantOpen daily, our Scrumpy House Restaurant and Tea Rooms offer a wide variety of food and drink for all the family. You can enjoy a fresh morning coffee, relaxing afternoon teas or fresh filled baguettes or paninis in our cosy converted cowshed Tea Rooms, which also houses one of the largest bottle collections in the world. Situated within the grounds of our Visitor Centre, Westons Scrumpy House is a charming restaurant located in an old converted cowshed. For a delicious homemade lunch, dinner (Thurs-Sat) or traditional Sunday roast, using locally sourced fresh Herefordshire produce, then a visit to our Scrumpy House is a must. The charming dining area is full of original features and character and can comfortably seat 44 diners. The terrace is sun-drenched in the summer and offers a wonderful view of our Henry Weston Courtyard Garden. Alternatively, the intimate barn conversion with its wood burning stove provides a the perfect relaxing atmosphere during the cold winter months. Chris Murphy, Scrumpy House Manager and Chef, has over 30 years experience in the hospitality industry and is passionate about creating fine food using local produce. Chris is keen to share this with his customers, old and new. "Our meat is from local farms and traceable, our poultry is free range and our vegetables are local and organic where possible. In addition, every Thursday we offer a hearty selection of homemade pies, created using prime cuts of meat from Herefordshire." explains Chris. The Scrumpy House is a licensed establishment where children are welcome. Booking is recommended, especially for Friday and Saturday evenings and Sunday lunches. Party bookings are also welcome. 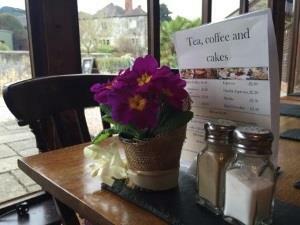 Open daily, our Scrumpy House Restaurant and Tea Rooms offer a wide variety of food and drink for all the family. Leave at Junction 8 and drive along the M50 to the first roundabout (outside Ross on Wye - "The Travellers Rest"), approx 22 miles. Take the A40 through Monmouth and past Ross-on-Wye to the "Travellers Rest" roundabout at the begining of the M50. Drive for approx 5 miles and at the cross-roads in Much Marcle (with the old garage) turn left. We're only about 1/2 a mile from the crossroads and clearly signposted.